Vinegar is made through fermentation of sugars into acetic acid by microorganisms. It can be made from any fruit or any material containing sugar. 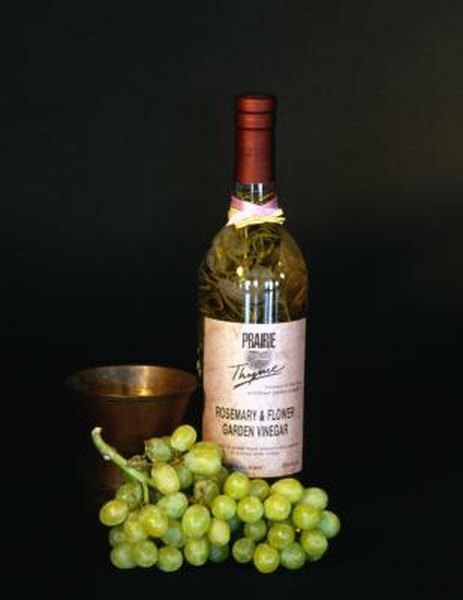 Grape vinegar is synonymous with wine vinegar and is made by further fermentation of wine. It's used as a condiment, for pickling and to prepare some sauces. It is also strongly bactericidal and is used in traditional medicine to cure infections. Grape vinegar is low in calories and consumption is associated with a number of health benefits. The August 2009 issue of “Bioscience, Biotechnology and Biochemistry” reported that acetic acid -- the main component of grape vinegar -- can suppress body fat accumulation. The study, which was carried out among obese Japanese subjects, involved the participants drinking 0 milliliters, 15 milliliters, or 30 milliliters of vinegar daily for 12 weeks. Following treatment, the two groups drinking vinegar exhibited lower body weights, waist circumferences and blood triglyceride levels than the group not drinking vinegar. Research reported in the September 2005 issue of the “European Journal of Clinical Nutrition” investigated whether addition of vinegar to a bread meal impacted on the postprandial glucose and insulin responses. The study found that the addition of vinegar resulted in lower blood glucose and insulin levels following consumption of the meal. The participants also reported increased satiety after the addition of vinegar. The higher the amount of vinegar used, the more pronounced these responses. These altered metabolic responses are also expected to be seen after consuming pickled products. Consumption of vinegar is beneficial to type 2 diabetics, reported the November 2007 issue of “Diabetes Care.” The researchers found that subjects taking vinegar at bedtime had lower blood glucose levels in the morning compared to subjects taking a placebo. This was the first study to describe a hypoglycemic effect of vinegar apart from mealtime. The authors attributed this to the effects of acetic acid on glucose metabolism in the liver, and note that vinegar may be beneficial to diabetic individuals to suffer from a pre-breakfast spike in fasting glucose, an event known as the dawn phenomenon. Grape vinegar, like red wine, is rich in polyphenols. These substances are powerful antioxidants that can help to protect you against damage by free radical molecules. Free radicals have been implicated in a number of chronic conditions including cardiovascular disease, cancer, and inflammatory conditions. The darker the vinegar, the higher the antioxidant content. Bioscience, Biotechnology and Biochemistry: Vinegar Intake Reduces Body Weight, Body Fat Mass, and Serum Triglyceride Levels in Obese Japanese Subjects; Tomoo Kondo et al.